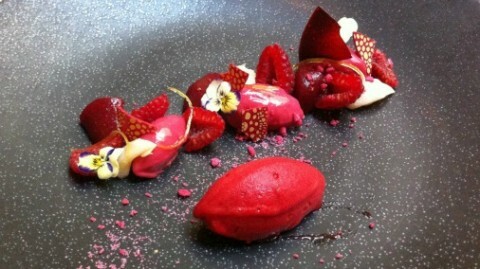 Ones of the UK’s top pastry chefs sat down with me to talk and taste. 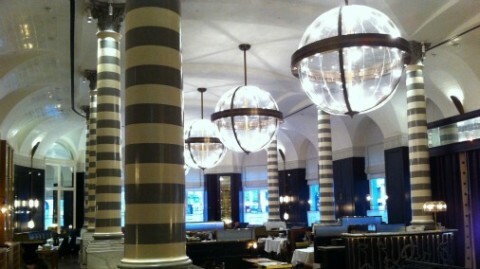 In late October I had a very important date at the Corinthia London Hotel. Pushing out of the cold through heavy double doors, past smartly clad doormen in their essential thick coats, is to enter another world. I was on Whitehall place, hardly slumming it, and the 1855 façade is elegant and somewhat stately. And inside there is a hush, a calm, an air of ease and luxury, that set the scene for what was to be a few hours of absolute escape. 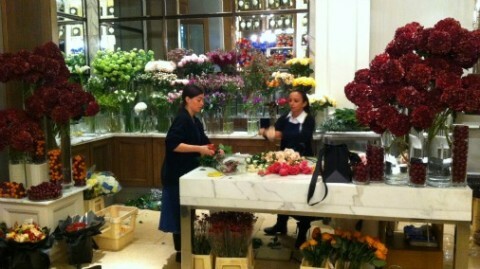 The hotel’s beautiful in house florist. 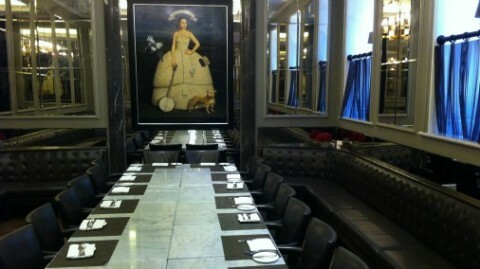 A private dining room – yes please can I have a party! 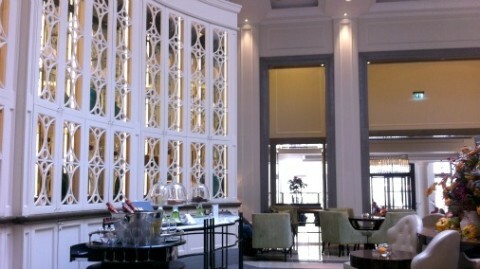 I was at Corinthia to catch up with Sarah Barber, their Executive Pastry Chef. I have been following Sarah’s work for a couple of years, and long been meaning to sit down with her and find out more. 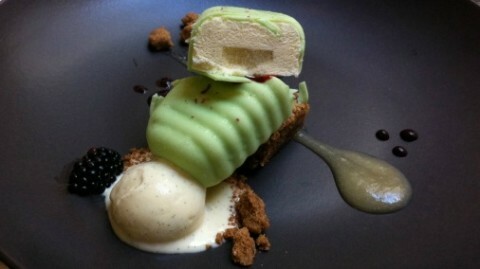 Her work is precise, visually stunning, well thought out, and above all delicious. She has found the perfect setting for her talents. 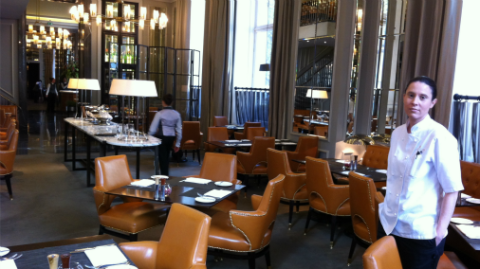 The interior of Corinthia London is sleek, but comfortable. It has a high-ceilinged grandeur, that makes it very special occasion worthy, but just the right amount of detail and artwork to make it also warm and comfortable. It made me long to be one of the penthouse dwellers, so I could pad downstairs without leaving its cosseted world. 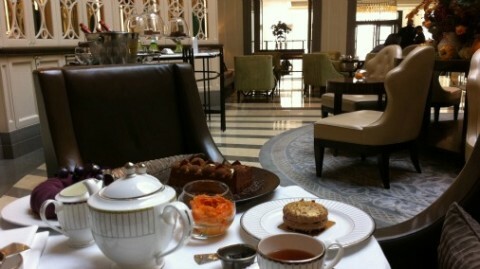 I could have the exquisite afternoon tea, which is served with warm efficiency and calm solicitude. And then I could pad back upstairs to lounge in indulgent overkill with the luxurious pretty chocolates that Sarah makes for all the penthouses. Well I can dream! Glamour as the bar turns into pastry heaven for the launch of Sarah’s new book. The new book, and some cakes. Sarah began her career at the Park Lane Hotel, where she worked part time to fund the studies that took every other minute of her time from aged 16. Her much beloved grandfather was a chef, and his death during her final year at catering college has been formative in the determination she brings to her work. 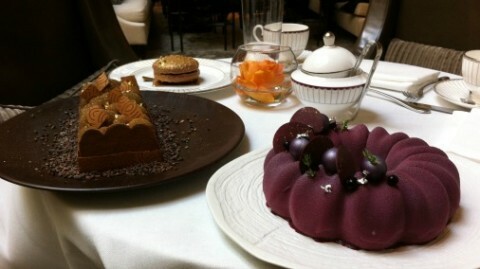 She was studying pastry at the time, and she committed herself to it, her career from then on a form of tribute to him. 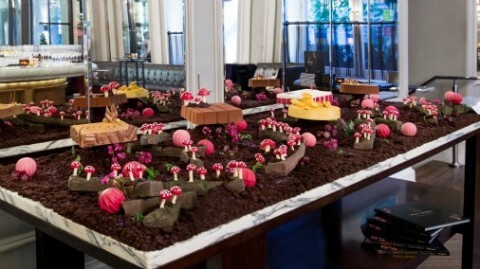 A chocolate forest for her book launch! Post college she went to the main pastry kitchen at The Connaught, under Michel Bourdain, and hasn’t touched the ground since. 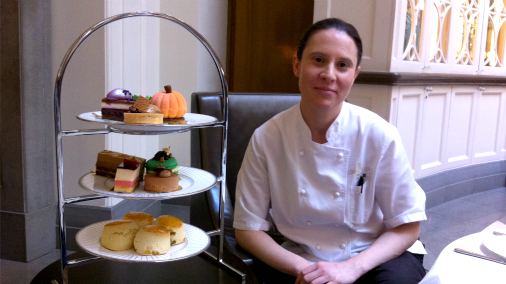 Most recently Executive Pastry Chef of ME London, she has been at Corinthia London since June 2015, where she steers a happy team of ten to excellence in everything a busy top class hotel needs. From pastries to plated desserts for the hotel’s Modern British restaurant Northall, via banqueting and chocolate showpieces for the penthouse suites, Sarah and her team are on it. Sarah in the hotel’s Northall restaurant. 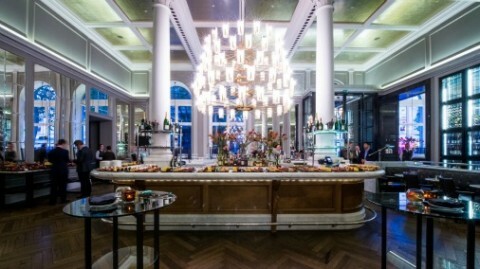 The hotel also houses the gorgeous Italian restaurant – Massimo. 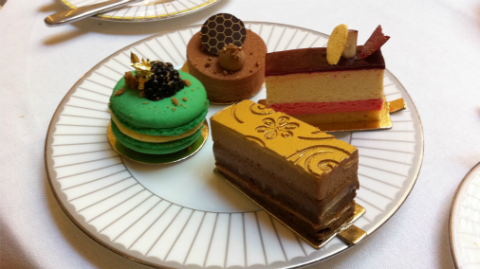 And of course there is afternoon tea, or should I say AFTERNOON TEA! 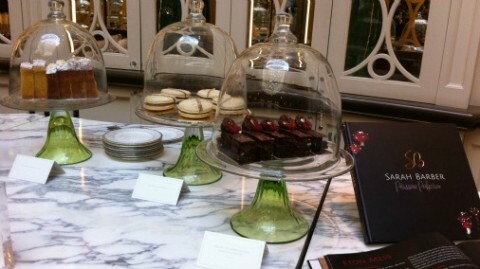 The lavish array of beauties that arrived are testament to Sarah’s fine eye for detail and attention to flavour. Word is getting out. They serve around eighty teas every weekday, and up to one hundred and twenty each day at the weekend. If you had the time and metabolism you could eat tea here all the time and never get bored, as there is always a theme, which changes regularly. For occasions like Halloween and Valentines there are week-long special menus, and seasonal menus, such as those for Christmas or Summer, are generally on for around six weeks. The elegant lounge setting for tea. Shall we start with cake! On the day of my visit I was privileged to taste things from across Sarah’s offering. We started with a couple of large cakes, which could be ordered for a group to eat in or take away. The Cassis & Violet combined the tricky floral note in perfect balance with fresh intense blackcurrant. A light, moussey, beautiful creation. The next was a layered dream, with hazelnut praline mousse, mandarin mousse, milk chocolate and orange ganache and Sacher sponge. The classic flavour combinations of chocolate and orange, that for me evoke the Christmas stocking chocolate classic, are here rewritten in delicate cake form. For the Northall Restaurant’s plated desserts, Sarah has wanted to offer both indulgent puds and a lighter choice, something that wouldn’t so much slay you as perk you up at the end of a meal. And for Sarah it is important that nothing is too sweet. Despite running a pastry kitchen, flavour rather than sugar rules her recipes. The first dessert I tasted was a perfect example. Raspberry, Lychee, Rose, combines those flavours as jelly, fresh fruit, crémeux and sorbet in fresh and delicious harmony, uplifted further by delicate strips of confit lemon. 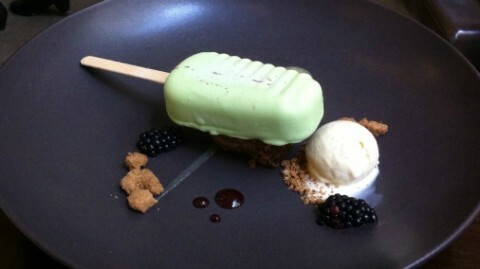 The second plated dessert Vanilla & Apple Lollipop is a riff on the classic blackberry and apple with custard. 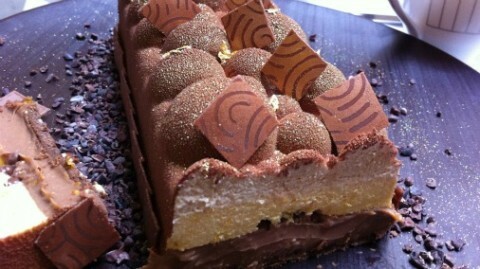 A vanilla parfait encases apple compote and sits atop a superbly dense and fudgey apple and calvados cake. Spiced crumb, apple puree and blackberry sauce complete a thoroughly modern dessert, that nonetheless evokes blackberry and apple crumble with custard. 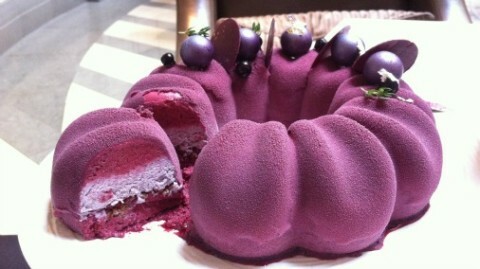 Apple, Blackberry & Custard revealed. And then? Well I couldn’t leave without the fabled afternoon tea. This starts with sandwiches, and then moves on to a three-tier cake stand to share between two. At the time that I visited the Halloween and autumn recipes were in full swing, so I was treated to the charming and delicate pumpkin mousse. Made with the flesh of fresh roasted pumpkin, this is a masterpiece of pretty cake making atop it’s round of pain d’épices. 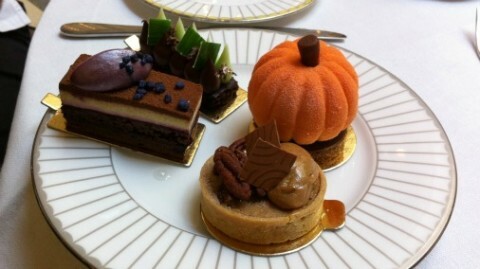 My first plate of tea cakes – including the divine pumpkin and delicious pecan pie. There were too many cakes to write about every single one, but they all deserved it. Sarah’s work is consistent, and consistently both delicate and full flavoured. Of the first plate, the Pecan Pie has to have been my favourite. In adding whipped salted caramel and pear to the American classic, Sarah did nothing to lessen the expected nostalgic taste, but added something lovely. It tasted just right, and that is quite a compliment, as for me true pecan pie is not to be messed around with! Of the second plate, there is quite some competition. I would be hard put to name a favourite. The Apple Blackberry Custard Macaroon is, like a fabulous soon-to-be-released chocolate hazelnut macaron I also tried, crisp without, fudgey within, and a fine specimen of the art. The Jasmine & Chocolate Slice is so well judged, the floral notes in the tea balanced by the touch of salt in the caramel. A fine thing. My second plate of tea cakes. Sarah’s favourite, and on balance probably mine too, was the Passionfruit & Ginger Cake, an olive oil biscuit topped by passionfruit pate de fruits, a chocolate and ginger mousse and a whipped ganache. This has both wonderful acidity and spice. The indulgent creaminess of the chocolate is offset by the slight grassiness of the olive oil which adds a hint of green. Fabulous! 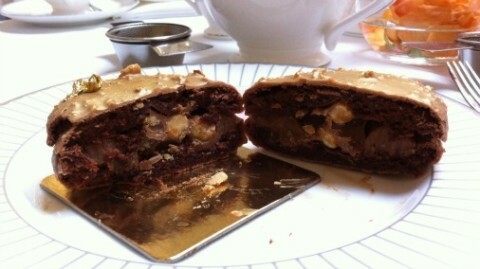 This winter’s special – Chocolate/Hazelnut macaron. No afternoon tea would be complete without scones, and despite having eaten sufficient cake to last me ‘til the following day, or more accurately to last me ‘til at least the following Tuesday, I have a particular passion for scones. I wouldn’t have passed them up for the world! I have made something of a study of scones, and Sarah’s are very very good. They escape well clear of both potential scone pitfalls, they are neither too doughy, nor are they overly rich with butter. 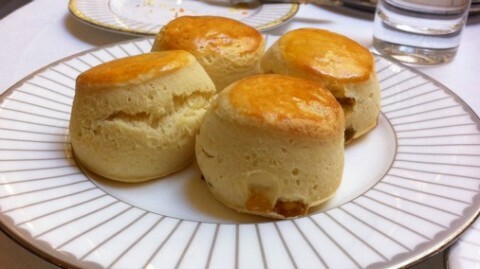 ‘Good’ scones can often be almost greasy with butter, to keep them moist or to signal that they are luxurious. I don’t like it, a scone is something with a distinct flavour all its own, clean and pure unadorned, or a vehicle for the cream and jam. 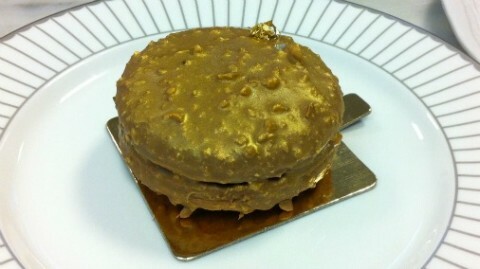 It is not a rich patisserie. These were soft, light, perfectly flavoured and moist, but as I said, not at all greasy. Almost like a brioche, but still distinctly a scone. A new and utterly worthwhile take on my favourite thing. Well done Sarah. 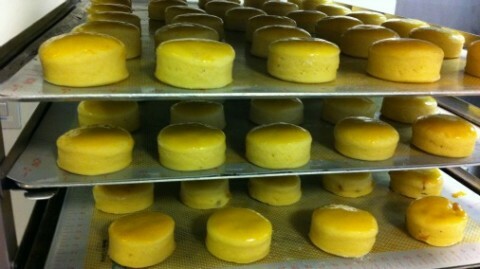 Scones ready to bake in the kitchen. The result – Sarah Barber’s SUPERB scones. Sarah has considerable form with chocolate, and uses Valrhona couverture almost exclusively. It is sensitively used throughout her patisserie, and her filled chocolates are technically immaculate and gorgeous looking. My favourites were a moreish peanut and dark chocolate combination, and a star anise ganache, which was fragrant with the delicate spice, well balanced with dark chocolate. 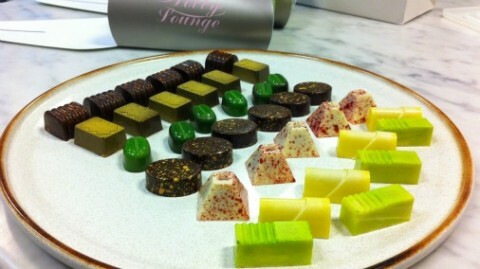 This winter her chocolates will be on sale in the chic shop within the hotel. 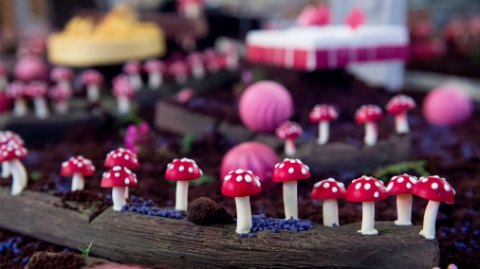 And look out for Buches de Noel and other Christmas specials – one of Sarah’s cakes would make an amazing party centrepiece. 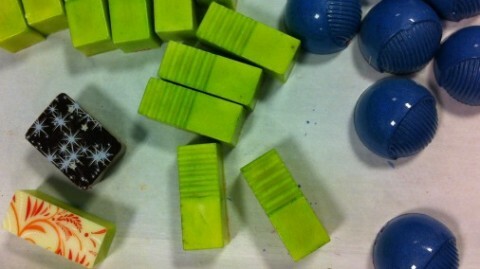 A selection of Sarah’s filled chocolates – which will be on sale this Christmas. 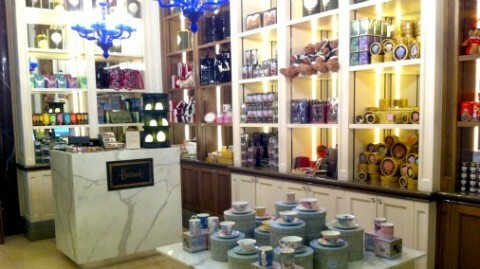 The gift shop inside the hotel that will have the chocolates and other goodies. In the kitchen and alongside her work Sarah exudes a calm confidence, which I am sure belies the amount of work it must take to be in charge of such a well oiled machine. Corinthia London is lucky to have her, and we are lucky to have her creativity to sample. Afternoon tea at here is like a mini holiday, time drops away along with your cares, and you are thoroughly and deliciously taken care of. I’ll be back.